I’m sure you hear the phrase often enough – “you are what you eat,” so they say. It doesn’t matter if you are an ectomorphic type, boasting a long and lean frame…if you eat french fries every day, it WILL show on your insides. The surface is not always a fair indicator. . .so don’t be deceived. I don’t have to write a lecture, or go on with some lengthy diatribe – we all have room for improvement, and we all know, deep down, in which those areas are. It’s okay to be flawed. It’s okay to enjoy ourselves. But remember that you have one body this go round – be kind to it. Remember to be mindful about how you treat it day in and day out. If you are overtraining, take more breaks. If you are eating garbage, try to clean up a bit. If you aren’t sleeping, try to get to bed a little bit earlier. Your body will thank you. You don’t have to stop living your life and enjoying goodies along the way, just remember that our daily habits add up. Maybe it shows, maybe it doesn’t – what’s important at the end of the day is HOW YOU FEEL. Whether you have energy, or feel lethargic. Whether you feel strong, or feeble. What you take in as fuel will make a difference – it will either be helping you stay strong, healthy and disease-free…or it will do the reverse. 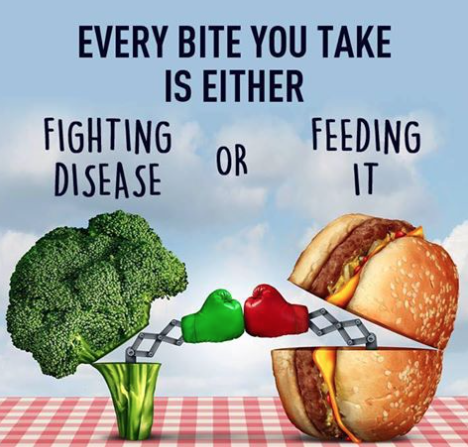 Personally, I’d rather take my chances with staying healthy as long as I can!